This easy 4 minute Peppermint Bark recipe will quickly become a family favourite and it makes a great mason jar gift too! OK, now seriously, we had been without a microwave since our last one died a few years prior to Jack being born and honestly I hadn’t really missed it. We decided we should probably pick one up though when we had a new baby around the house just to make life a little easier with heating up leftovers and making quick meals and stuff like that. I had been really resisting the whole microwave thing for a few years, but I’m really glad we’ve got one now that things have gotten a lot busier around here! One great thing about it is that it’s made one of my favorite easy Christmas-time recipes even easier! 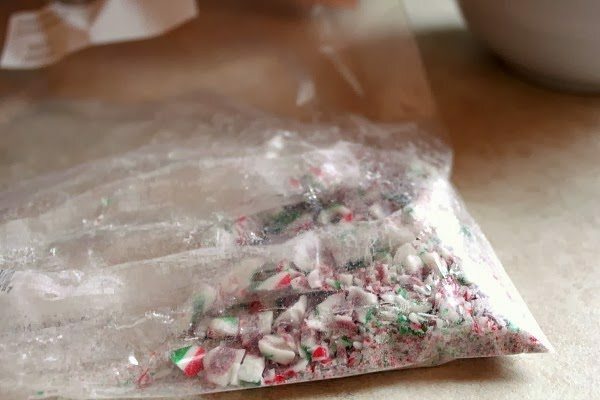 This peppermint bark is something that I make every year and people always seem to love it and say it’s the best thing they’ve ever had in their life, so it’s a good one to know about. 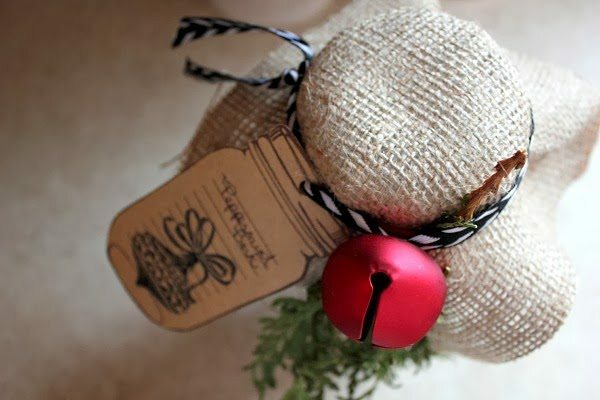 It’s a great thing to make for a little DIY Christmas gift for anyone you might still want to send a little holiday to. As with a lot of my favorite recipes, the amounts you use for the ingredients don’t really matter. What you need to get is some milk chocolate melting wafers and some white chocolate melting wafers. When I sent Chris and Kennedy out to the bulk foods store to get them, I just told them to get me about 1/2 a scoop of each. The milk chocolate that I use is called “compound milk chocolate” and it’s a little cheaper and I guess not as “high quality” as the other chocolate, but it’s absolutely necessary for this recipe. Using anything else or trying to substitute chocolate chips just doesn’t work for me. 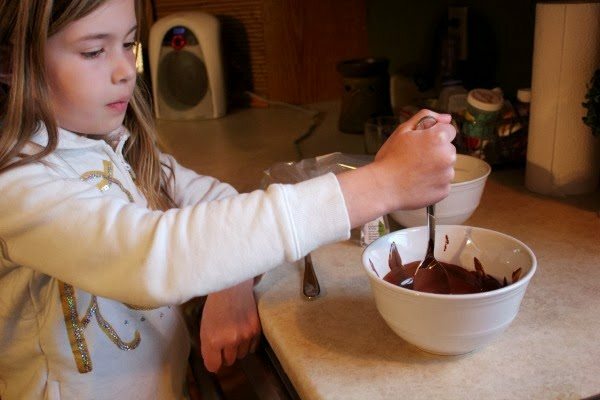 Here’s a photo of Kennedy helping me make the peppermint bark one Christmas a few years ago. Awwwww! So cute! So the milk chocolate gets melted in the microwave (yay!) in 30 second increments, stirring occasionally until it’s melted. 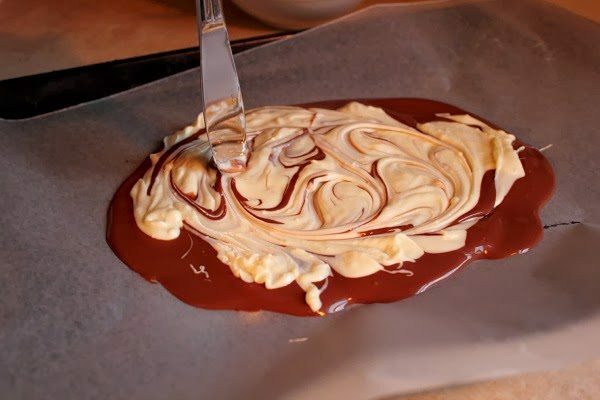 Then the chocolate gets poured out onto a baking sheet lined with waxed paper, parchment, or tinfoil. Next, the same thing is done with the white chocolate and it gets poured right on top. Before you pour the white chocolate, mix in a little bit of peppermint flavor, just for extra yumminess. Swirl the blob and spread it around with a butter knife to make it look all fancy. To make things really easy, I usually like to buy pre-crushed candy cane from the sprinkles section of the bulk foods store, but Chris said he couldn’t find any, so he bought normal candy canes and whacked them with a hammer a few times for me. Those just get sprinkled on top of the blob. It only takes a minute or two for the whole thing to solidify in the fridge and then it just needs to be broken apart into smaller pieces. I popped mine into a mason jar and topped it with some waxed paper and a few other festive looking doo-dads. The bark is so pretty, so it’s nice to show it off in a jar rather than hiding it in a tin. 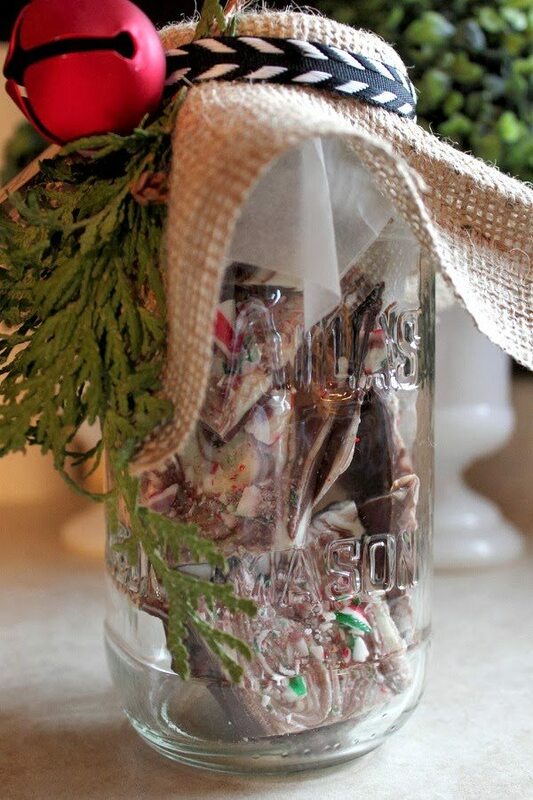 Mason jar gifts are so much fun! Who wouldn’t like to get a little treat like this? 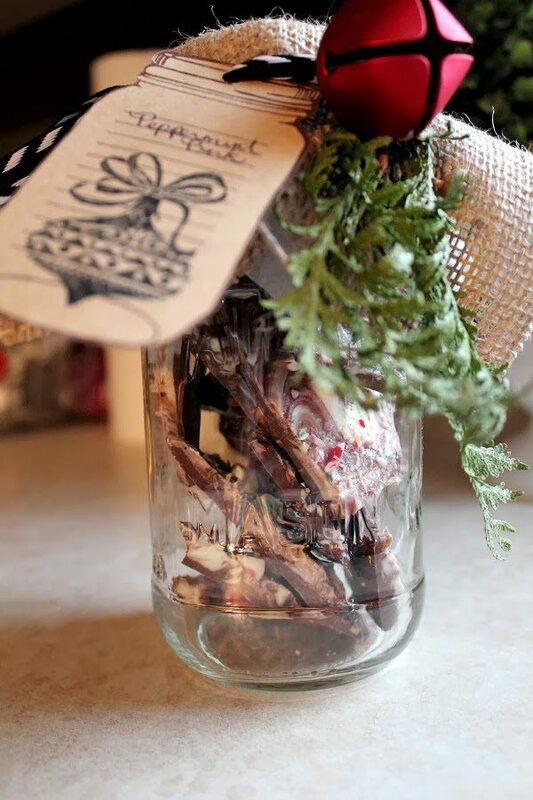 Do your gift recipient a favor and make sure the jar is decorated really cutely. That way they might want to keep it on their counter to enjoy for a few days before they open it up and start wolfing it down. 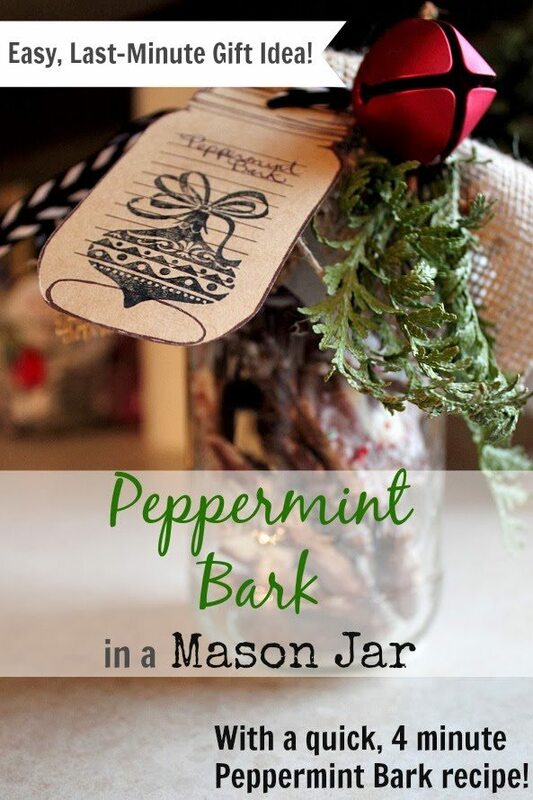 Once that jar is open and you get a taste of the peppermint bark, there’s no going back! Resistance is futile! 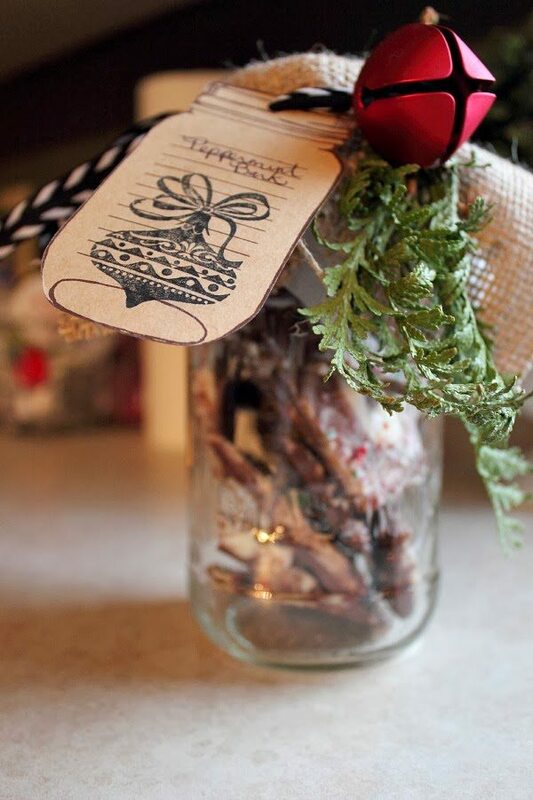 Create this look using: A Mason Jar, 1 Red Jingle Bell, a Gift Tag, some Burlap and Fresh Greenery. I always have a few jars that never make it out of my kitchen each year. 🙂 I think a few more batches of this might be in order this year! 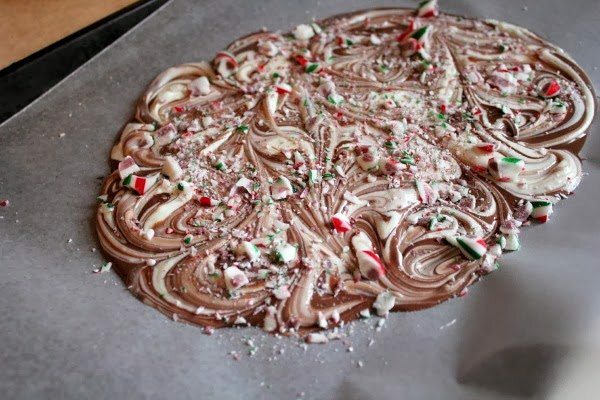 If I get no other treat making done this Christmas, at least I know I can whip up this peppermint bark in 4 minutes flat! This easy 4 minute Peppermint Bark recipe will quickly become a family favourite and it makes a great gift too! 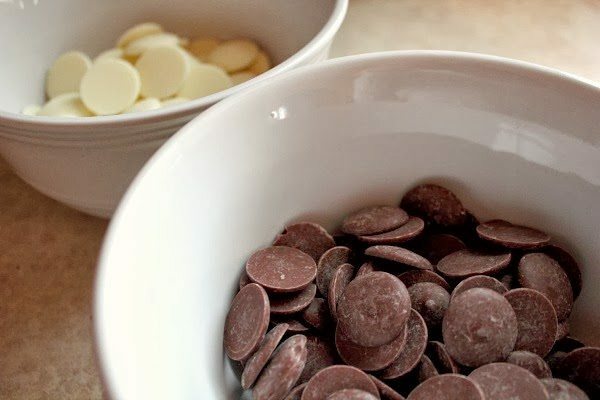 Melt the milk chocolate and the white chocolate in the microwave in two separate bowls. 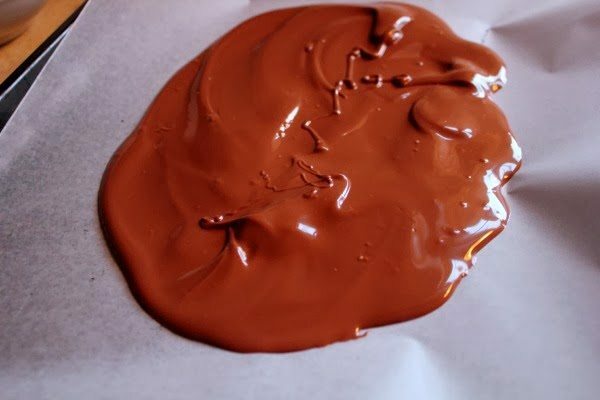 Pour the milk chocolate down onto a baking sheet lined with parchment paper. Pour the white chocolate right on top of the milk chocolate. Swirl the two colors together with a butter knife. Put the baking tray in the fridge for about 5 minutes to allow the bark to set. Break the bark up into bite size-ish pieces and store in an airtight container. The is post contains affiliate links. Simple and pretty! Christmas blessings to you! This is sweet in more ways than one! Easy and yummy. I love the presentation in the Mason jar. Thanks for the hints. Have a wonderful Christmas with your family and we baby Jack. I be Kennedy is pretty excited about Christmas. Enjoy!! I just may do the same thing…Bake nothing else, but the peppermint bark!! Thanks for sharing this easy & mouth watering recipe!! Whether we do a lot of baking or not, this is always our one “must make” treat! Hope you like it, Karen! thanks so much! 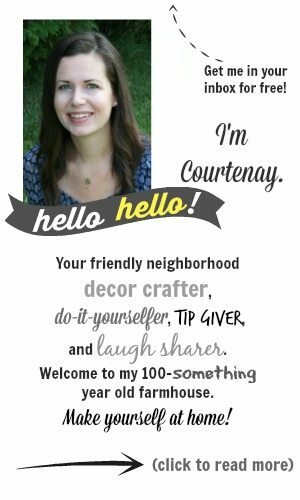 How did you make such a pretty tag? Did you have a recipe for making trash in the microwave? Is there a place to download the gift tags? I am going to make BATCHES of this, can’t wait!! Thank you for the recipe and gift idea! It’s -20 here today, so once I get the supplies, I’m staying in and enjoying your ‘gift’ for my loved ones! 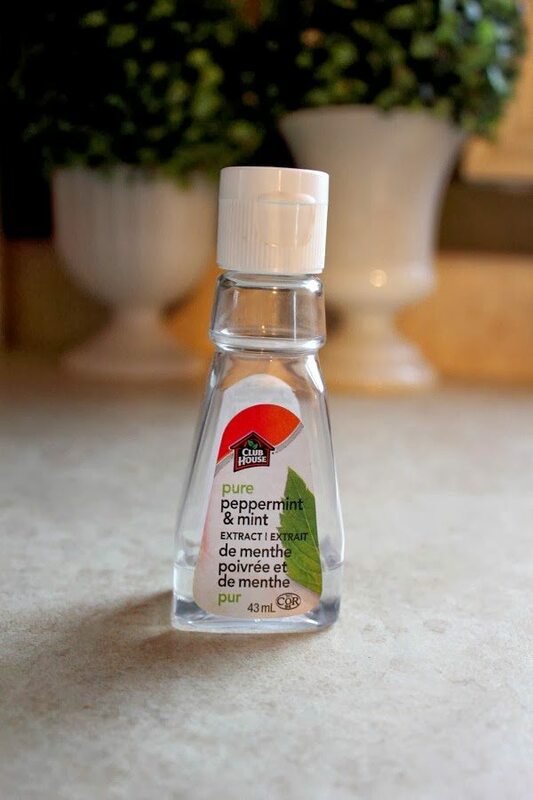 I know it’s been years since you posted this but I have to ask, when do you add the peppermint extract? And to which part? This looks so luscious and I would love to make some! Hi Shirley! I don’t think it really matters, but I always add the peppermint to the white chocolate. We actually just made this a couple of days ago and it turned out perfectly as always! Definitely recommend giving it a try!